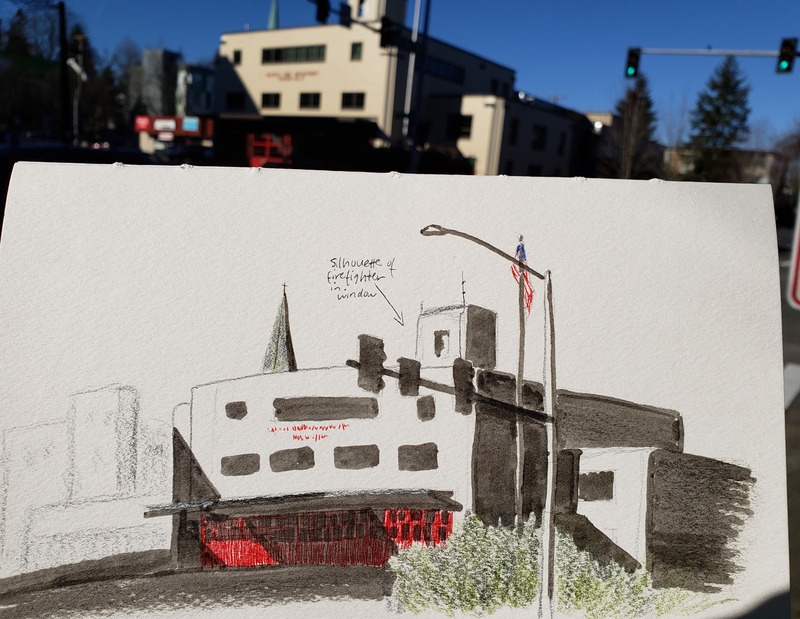 After dropping off my car for servicing in the University District, I eagerly walked up Roosevelt Way Northeast to look for something to sketch on this spectacularly sunny and mild afternoon. Near the intersection of 50th and Roosevelt, I have several classic buildings to choose from, including the Seven Gables Theater (which I sketched in 2017 after it closed suddenly), the Gothic-style Blessed Sacrament Catholic Church and the Carnegie-style University Branch Library. Because the light on it was appealing, I chose Fire Station No. 17, a Seattle Landmark building (and the church’s steeple behind it). 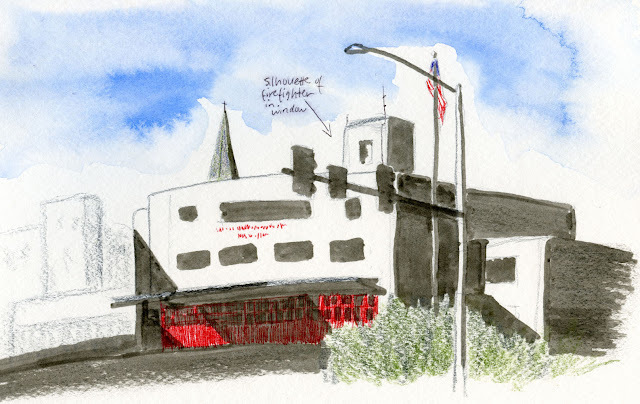 It was too small to show in my sketch, but the tower window includes a silhouette of a firefighter. Not shown is a tower on the other side of the station with more silhouettes. The art was added during a renovation a while back. I was nearly done blocking it in and was starting to think about color when it suddenly hit me: My minimalist sketch kit doesn’t include red! Whoever heard of sketching a fire station without red? Having purple shadows is one thing, but some colors are important symbols that can’t be substituted. (Interestingly, I experienced a similar frustration during last year’s minimalism challenge when I was missing a symbolic color.) Kicking myself and my secondary triad (which I have otherwise loved using), I was saved by my four-color ballpoint pen (which I keep in my bag for notetaking, not sketching). No blue for the sky! As for that brilliant blue sky, it’s not exactly a symbol, but after all those weeks of gray and rain, I was eager to color it . . . not. No blue in my bag! I rarely continue working on a sketch after I’ve left the location because I usually lose the impulse and freshness of the moment. But this time I couldn’t stand it; I added the blue sky after I got home (the on-location view is at right). That does it: January is over, and so is my minimalist challenge. I’m going back to my full color palette. Self-enforced minimalism makes me appreciate more the items I’ve missed. Like last year, though, I’m going to think very carefully before I put things back into my ultra-lightweight bag, which has been liberating to carry. Stay tuned for the post-minimalism sketch kit update.